Pure water is a necessity of life! Pure water is an essential nutrient and a necessity to sustain our lives. Water needs to be clean, and free of toxins and microbes to prevent disease. Drinking water can help reduce illnesses by decreasing toxins and inflammatory histamines, as well as flush out contaminants, waste, and microbes. Our Envy™ Series Reverse Osmosis Whole House System completely filters all harmful, unnatural, and synthetic toxins out of your homes water. When you drink water filtered through an RO unit, you’re getting 100% pure, high-quality drinking water that tastes great. 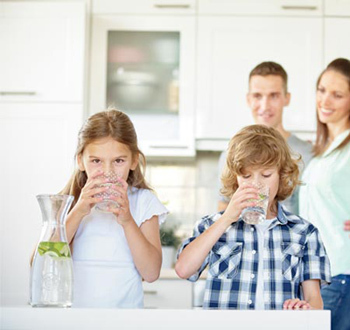 Our Envy™ Series Reverse Osmosis Whole House System will pay for itself in no time because you’ll only be paying pennies per gallon verses buying bottled water. Plus, whenever you need clean drinking water, it’s right there at the tap. 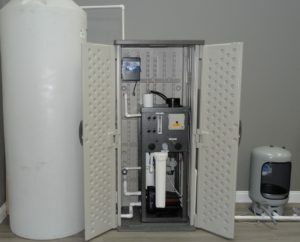 The Envy™ Series Reverse Osmosis Whole House System provides a filtration process that incorporates pre-filtration, a membrane, and a polishing filter that extracts the smallest particles to lower TDS (total dissolved solids) up to 95%. This process will remove salt, lead, arsenic, nitrates, bacteria, E-coli, coliform, and cysts. It will also protect your fixtures, clothing, dishes, and appliances. Reverse osmosis water will never leave you feeling slimy, and rinses completely, leaving your skin feeling soft. Feature: Single membrane reduces TDS by 95%. Feature: Pre-filtered designed to remove debris. Feature: Sealed treated water storage tank. Benefit: Keep clean and contaminant free. Feature: Installed in UV protective cabinet. Benefit: Protects and extends life. Feature: Ozone treated storage tank. Benefit: Prevents bacteria growth in in treated water. Feature: VFD constant pressure pump. Benefit: Provides constant pressure in the house. Feature: Post filter to polish water and neutralize PH. Benefit: Scale build up prevention.